Designed to fit all possible M20 applications and displacements in the E30 chassis, our M20 6-branch exhaust manifold set flows 23% more gas than BMW’s standard RHD manifold. In addition, the improved heat dissipation of the 6 individual exhaust tracks reduces the occurrence of head failure, especially with the fragile 885 casting found on B25 engines. 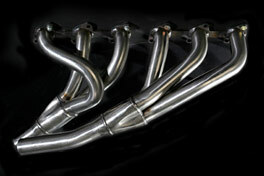 The manifold set includes link pipes to fit BMW’s 3 piece exhaust system.